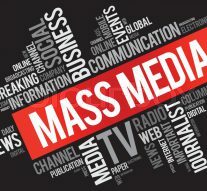 Mass Media or the different forms of Mass Media are a designation of the means of daily practice by collecting, processing and distributing messages to mass audiences. It is the way people communicate and share information. The evolution of the world as well as human evolution led to the development of mass media. Throughout the years, mass media has changed and organized these new ways of communication. From the first appearance of drawings and books, to the advancement of 21st century smartphones and many other forms of communication. Mass media is the primary source of information we receive and share daily. It affects our thoughts, opinions, and interests. From my childhood until now, my personality was built from what I heard, what I saw, and what I experienced daily. I was born in Russia, in the city of Saint-Petersburg on April 7th, 1996. The very first form of mass media I experienced was television. As a child I could not yet read, and fully comprehend everything, so I watched shows designed for kids. One of my favorite shows was Teletubbies, which was a British pre-school children’s television series. The premiere of the show was in 1997, created by the BBC. The show was based around four characters Teletubbies. These characters were humanoid plush creatures with antennas on their heads and video screens on their stomachs. It was a bright, funny, and entertaining show for kids of my age at that time. The effect of the show and its primary purpose was to teach children a little bit about the world and morals, as well as to entertain and distract us from annoying our parents. My elementary school media use included books and television as well, but since I learned how to read books grabbed my attention entirely. Besides reading our formal school textbooks, I was a huge fan of fantasy and comic books, for example: W.I.T.C.H by Elisabetta Gnone, Alessandro Barbucci, and Barbara Canepa; The Adventures of Tom Sawyer by Mark Twain; The Adventures of Robinson Maize by Vsevolod Nestayko, Carousel over the city and The Secret of the Iron Door by Yuri Tomin, and others. Most of the books I read were written by Russian writers and poets, since I was still living in Saint-Petersburg, Russia at the time. The main effect of those books is that it opened my eyes to the world, and expanded my imagination and horizons, which led me to start writing on my own. At the age of seven, I already started to write my own fairy tales and small poems that entertained some of my classmates, friends and family members. One of everyone’s favorites was a series of stories I wrote that was about the adventures of a little girl named Luna. It contained funny stories similar to my life, but also a little bit of fantasy and magic. Another story I wrote but never finished was called Snow Kiss. This story was about a young girl that gained superpowers and the tale of her crazy adventures. Her adventures were mysterious, funny, and dangerous, but amusing to write. I also wrote some poems and other stories that I still keep to this day. It is interesting to reread them as it brings my childhood memories and emotions back. My middle school mass media use changed my whole world when my parents obtained our first Windows PC. This new form of communication was a big white box of global connections, informational sources and games. I started to be heavily involved in online games, where I met new friends and spent many hours of my day. I also registered on the popular Russian social media networking service called VKontakte. There I started to post pictures, write blogs, and engaged in conversations with people all over Russia and Europe. The internet had some positive influences, such as learning more about the world and meeting new people, but it also had its negative factors. This from of mass media use was so entertaining and new to me that it took most of my time; I abandoned my writings, procrastinated new readings, and stopped playing outside with my friends. During my high-school teenage years, I came back to reading books, as well as the combination of movies and online communities. Half of my high school years, I spent in Russia, and then at the age of sixteen I moved to the United States. That is when my life began to change entirely. I learned more and discovered new mass media outlets, such as: Instagram, Facebook, and Twitter. I started to read American writers: Ernest Miller Hemingway, Stephen King, Edgar Allan Poe, Ray Douglas Bradbury, Raymond Thornton Chandler, etc. I also discovered new TV shows, movies (mostly on Netflix) and started to listen to local radio stations. These new forms of social media brought me closer to American culture, their lifestyle, and definitely helped me to learn the English language. Robert Greene, 1998. This book is a bestseller and was recommended to me by one of my good friends. In my opinion, it is the most amoral, the most scandalous, the most cynical, and the most truthful book about power. It starts straightforward with a short list of laws and principles to follow and succeed in life. The author is sharing his knowledge of the tough and cruel laws and behavior of the powerful. It is brilliantly formulated and supported by the most interesting and unexpected historical facts. This book helped me to recognize what is behind the words and actions of some of the world’s most powerful people and what they are trying to accomplish. It is one of the most brilliant psychological books I have ever read. Another current influential form of mass media I use the most is a TV show on Netflix called Black Mirror, which is a British television anthology created by the script of Charlie Bruker. Each episode is not related to each other neither by plot, nor by the actors, or by the time and place of the narration. According to Charlie Brooker, all subjects are united only by the satire on the way of life that is common in modern and future society. The main theme is the influence of information technologies on human relations and interactions. The creator of the series, Charlie Brooker, explains that the name of the show Black Mirror is a reference to the black displays of electronic gadgets that exist in every house or apartment. As he said, “If technologies are drugs, and they really look like drugs, then what are the side effects? The border area between pleasure and discomfort is the scene of my dramatic series The Black Mirror. You will find a black mirror on every wall, on every table, in every hand: cool and shiny screens of televisions, monitors, and smartphones” (Edinburgh Television Festival, 2017). In conclusion, my mass media demographic would be categorized as Generation Z. We are the Post-Millennial generation that some refer to as innovative and technological influential. Most of Generation Z have used technology, social media, and the internet since birth. The Generation Z age group has no precise beginning date, but researches usually use the mid 1990’s to mid 2000’s. Some people say that doing business today requires the combination of innovation and individuals that belongs to the Generation Z. I feel that my experiences in mass media throughout my lifetime has shaped and prepared me for my current and future projects, goals, and aspirations in my life.